It has been a time of introspection for me to decide how I wish to express my voice through this very explosive time of political activity here in the US. Before I begin, let me state a few considerations for you to keep in mind as you read. First, I am deeply committed to maintaining an openness and understanding of others beliefs and opinions and therefore do not intend, in any way, to imply in this correspondence that my reflections are the correct ones nor do I wish to convince anyone of anything. Rather, this blog is a reflection of my inner desire to share some deep feelings I have about the matter. Second, that my work, singing Kirtan and exploring the Bhakti path, in essence lives outside and beyond the realm of politics and even duality. So, I write to you all, in the most personal sense. In other words, I do not wish that my beliefs in this matter, should affect your capacity to enjoy and receive the universal thread of oneness that my music and yogic teachings offer. Last, as a citizen of the United States, I am deeply triggered by the current wave of political life and the consequences on our future and that is why I am writing this; as a means of self expression to my community. So, it is with these three concerns indicated, that I express my reflections and feelings on the presidential election and my support of Barack Obama. I first became drawn into the current political process upon watching Barack Obama speak - it was really the first time that politics grabbed me (note I come from a family of politicians). It wasn't politics though that grabbed me, it was Obama. I sensed truth and I felt a man, very simply put, coming from his Heart. Ever since, I have been following what has been taking place on the campaign trail. I admit that my understanding of the system is limited and I also know that Obama is not perfect, like any of us. However, something in me, simply trusts this man. Beyond the political rhetoric, there is a force and depth moving within him, that in my estimation is transparently connected to Spirit...at least how I experience Spirit. I feel he represents the true qualities of leadership - that he is one who, by Soul Force, will be able to change the emotional and spiritual landscape of our country in a way that will affect us on many deep levels. I believe that he will reflect to us, as a culture, our true destiny and support us in revealing our highest ideals and aspirations. One of the most compelling motives for communicating my support of Barack Obama to all of you, is for the following reason. I have found that many living a strong inner life and on the yogic path, may tend to avoid the discursive, divisive and plain ugly world of politics. I know I did. Perhaps we do this because we value the depth of our inner world to such a great degree and also because we are surrounded by so much light in our lives that it may simply seem that it just doesn't matter to us. So, let me share my two cents - it does - and if not to us, to many others who are not so privileged to lead the life and partake in the opportunities that we are so blessed to have. So, without preaching, and from my heart, I urge everyone to register and vote, get involved, get informed and decide for yourself which candidate speaks to your beliefs and values. My choice is clear, this November, I will cast my vote for Barack Obama. If it resonates with you, please feel free to share these reflections with others on the path! Check out this link. Very interesting. 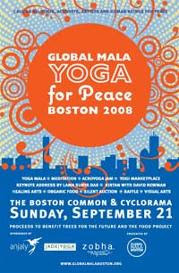 The Global Mala Yoga For Peace Event in Boston, MA on September 21st. RISE UP! Be a Yogi in Action for Peace and Mother Earth by joining with the Boston yoga community to celebrate UN International Peace Day and raise consciousness through various yoga practices including Sun Salutations, meditation and chanting. Keynote speech by LAMA SURYA DAS and Kirtan by DAVID NEWMAN. Proceeds will benefit Trees for the Future and the Food Project. Local sponsors are: Anjaly, Cabot, JadeYoga, Zobha. SAVE 9% ON YOUR TICKET USING THE PROMO CODE "PEACE"
During the next two weeks I am thrilled to be sharing the love of yoga, chant, fellowship and good eatin’ with other like-minded folks seeking a healthy lifestyle all across the country. During the New York City leg of the Yoga Month events (www.yogamonth.org) we will perform a benefit kirtan concert for the Youth Health Alliance. Spend the day taking yoga classes, attending workshops with top teachers, visiting the exhibits, and then join us for an evening of blissful chants (some from my newest CD release titled “Love, Peace, Chant”). After the Big Apple, we hit the road to Arizona for kirtans and workshops in the fabulous towns of Tucson, Gilbert, and Tempe. We end up at the Raw Spirit Festival at Poco Diablo Resort in breathtaking Sedona, just beneath Arizona's famous Red Rock Mountains (www.rawspirit.com). If you’ve never been to the Raw Spirit Festival, it is the largest raw vegan, eco-peace celebration which promotes healthy living, eco-sustainable solutions and World peace. Seminars, speakers, music, dance, yoga, and organic raw vegan foods … what more can you ask for?! See the events page for more information on the NYC and Arizona events.